I’ve only read one of Jim Butcher’s Dresden Files novels, but I’ve come to enjoy the graphic novels based on the popular Harry Dresden character. Wild Card is the latest in the graphic novel series and is much more ‘average’ than some of the others that I’ve read and reviewed. Wizard P.I. Harry Dresden comes across a big new bad guy and knows that he might need to unite a couple of different factions who control various positions of power around his city. But the various factions aren’t particularly friendly toward one another, making Dresden’s job much more difficult. Ultimately, it comes down to Dresden’s savvy ability to understand what the dreadful creature really wants that will eliminate the threat. This story was much more simple than some of the others that I read and the different factions is in some ways a red herring to the mystery, but in reality probably just a way to space this too simple story into multiple issues of a comic book. The ‘bad guy’ here is truly a creation of the comic book genre. From his over-the-top appearance to his behavior, he does not strike me as anything we would read about in books or short stories – only in the comic books. Is this a bad thing? It all depends on what you are looking for. I like my stories with a little more meat to them. I like my graphic novels to be a case where the art enhances the story and vice versa, but I didn’t get that here so much. There is nothing wrong with the art (other than a clownish fiend) – it’s relatively strong and consistent, though nothing packs a real powerful punch, either. Overall, this was a pretty average, bordering on weak, Harry Dresden graphic novel. Publisher Dynamite has done better and I look forward, hopeful that the next release will be stronger. Looking for a good book? 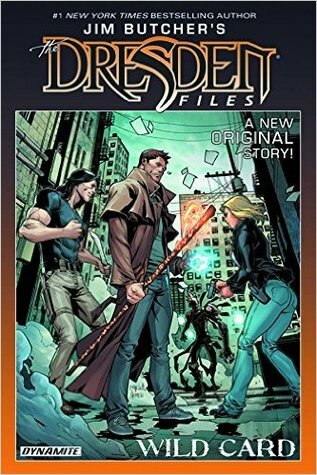 Jim Butcher’s The Dresden Files: Wild Card is a graphic novel that isn’t nearly as strong in story as others in the graphic novel series. artists: Carlos Gomez & Sean Izaakes & Anthony Fowler, Jr.